The Hills, which is the back nine of the original eighteen, is so named because it begins high and follows the natural contours of the Hill Country, with homes perched above the holes. It displays a beautiful shot in the opening, then turns up and right. Tom Kite did a masterful job accentuating the natural terrain on this nine-hole course. 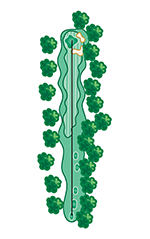 Most greens have a .5% to 1% slope, with a soft, undulating surface that will give you a chance to make your putt. If you are within 25 feet to 30 feet, you have a great opportunity. 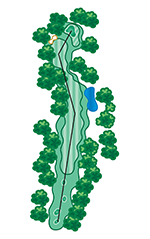 Holes #2 and #3 are par 3’s that sit down in the hills, then #4 is a nice par 5 with a slight dog-leg and meandering creek – a gorgeous setting. 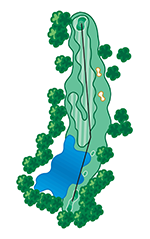 Hole #5’s most unique feature is its two-tiered fairway. If you hit onto the lower ledge, you do not have a clear view of the green. However, if you land on the upper ledge, the view is unmatched. One of the best holes of all is #6. It originally was a short hole, but a redesign that came with the installation of the third nine made it a little shorter. It is a drivable par 4 with great mounding and native grasses behind it, so it stands out. Then you work your way back up the hill again on the finishing holes. Hole #9 is memorable as a par 5, with impressive bunkering and strategic trees that provide an outstanding risk/reward finishing hole. This beautiful par 4 is another of the picturesque holes at Comanche Trace with unbelievable views of the Texas Hill Country. The lake is a good target off the tee as it will be out of play for most golfers. The second shot is deceptively up hill. This three-tiered green will prove to be one of the most challenging on the course. One of our favorite par 4 holes on the course! Hill country golf at its finest. Aim up the left side of the fairway towards the large oak and your ball will bounce right into the middle of the fairway. A similar strategy will also work on the second as the approach slopes from the left to right. 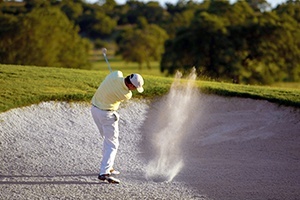 Any shot left may kick onto the green and you must avoid the gaping bunker right of the green. There will be no recoveries from this bunker. Beautiful par 3 set into the hillside. 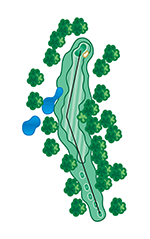 This, the easiest of the par threes, will require a short middle iron to the green, which has multiple hole locations. This will be your first view of the creek that captures the runoff from the surround hills and is such a dominant feature of the next couple of holes. Of course, this beautiful creek is not nearly as beautiful when you are dropping your ball instead of playing it, so hit enough club. 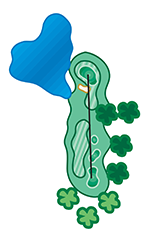 Another strategic par 5, that will test your mind as much as your skills. Options abound depending upon how well you hit your drive. 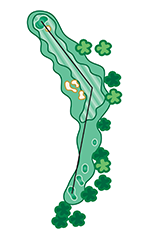 The creek you saw on #3 continues its trek down the hill and splits the fairway into two halves allowing you to get as aggressive as your heart desires. 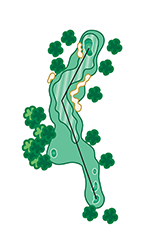 The green is about as benign as any on the course, so this is one of the best birdie opportunities on the course. But as with any risk/reward hole, some golfers will not be happy, while others will be ecstatic. 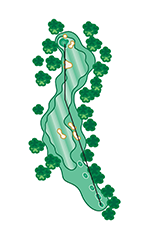 This demanding par 4 will require both length and accuracy off the tee. To have the best view of the green, the drive must stay to the right and be hit long enough to get to the top of the hill. But any effort to reach back and get a few more yards that results in a hooked drive will prove to be costly and playing from the left side will only cause your consternation. The green is totally open in the front allowing for run ups. This is one of the most interesting greens at Comanche Trace and it will test your lagging ability on some long putts. This downhill par 4 may be short, but certainly not short on possibilities. The golfer may choose almost any club off the tee. An iron will be safer for sure, but will only result in a more difficult second. While a fairway wood or driver demands perfection off the tee, but may result in no more than a chip shot to the green. Do not be fooled by the generous width of the fairway. Any shot left of the center will force you to play a semi-blind shot to the green while challenging the right fairway bunker will give you an open view of this green. Another great birdie opportunity! This 462-yard par 4 is one of the most demanding on the course. Aim your drive at the oaks on the right side to avoid the three bunkers on the left. But don’t go too far right as it will leave you a very long second shot. This large green is fronted with a small pot bunker that allows run-up shots both to the left and right. Only the unfortunate will land in this pot. On this hole the main problem will just be getting there, as the hazards are not too difficult. You can see home from here. But do not become too distracted by the views both ahead and behind you, you still have some golf to play. This medium length par three will be a real fooler. The large caped bunker fronting the green not only hides the left side of the green but also a grassy hollow. 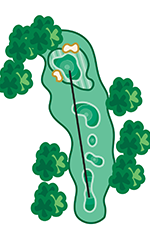 The green slopes from right to left, so any shot left hanging out to the right will result in a difficult chip shot. The beautiful lake is not nearly as close as it appears so feel free to gp ahead and take it right at the hole. This hole may look difficult but you may be quite pleased heading to #9 tee. What a way to finish. This is a great par 5 finishing hole. From the tee, the target should be to the left center, avoiding the large fairway bunker to the right. From there it is a clear shot thru the two oaks into open fairway surrounded by ancient oaks and huge bunkers. The approach is uphill, for sure, so be sure to hit enough club. This might be a good time to picture yourself competing in the club championship while having all your friends sitting in the amphitheater surrounding the green cheering you to victory.